I had kind of a rough day at work a few weeks ago– it happens. 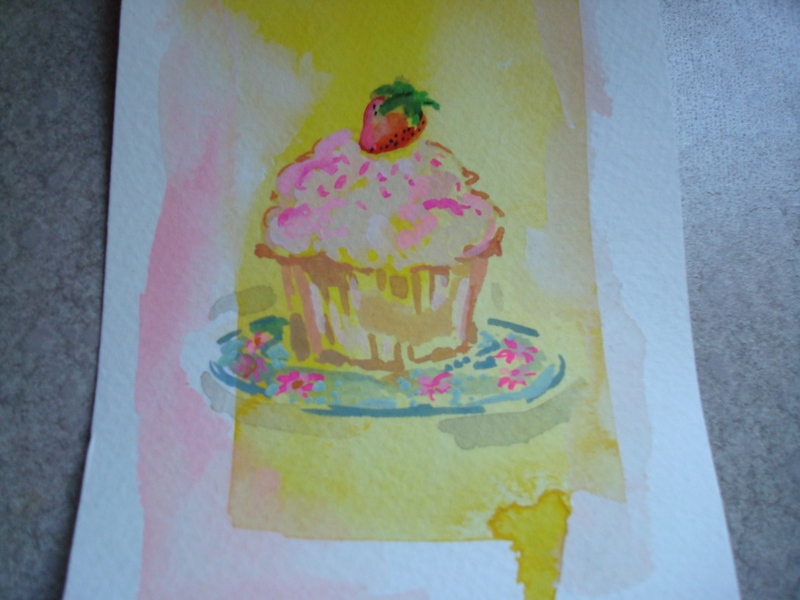 My cube-mate/friend/very-talented-artist painted this lovely picture for me to cheer me up. And it worked! It still makes me smile when I look over at it in the glare of the fluorescent office lights. You need stuff like that. Not only does it make me happy, but it inspired me to recreate it in real life! Who doesn’t like cupcakes? I don’t think there is anyone who doesn’t. They’re cute, fun, pretty, taste great– what’s not to like? I have made them in many iterations over the years but never strawberry-flavored, and since I picked a whole bunch of the lovely little berries last weekend I figured now is the time. I did a bunch of research for a recipe before making them and wound up shooting from the hip with an adaptation of a strawberry cake recipe I found from Martha Stewart. Her recipe was unfrosted and suggested baking the strawberries into the top of the cake but I wanted to mix them into the batter instead. I decided that a cream cheese frosting might be nice on them, but then thought I’d shake it up a bit with mascarpone cheese instead of cream cheese. I think it was a wise decision. Voila! You would have thought that my friend painted the picture after I made the above, right? Nope. Other way around. Good thing I have a small flowered plate! Preheat oven to 350 degrees. 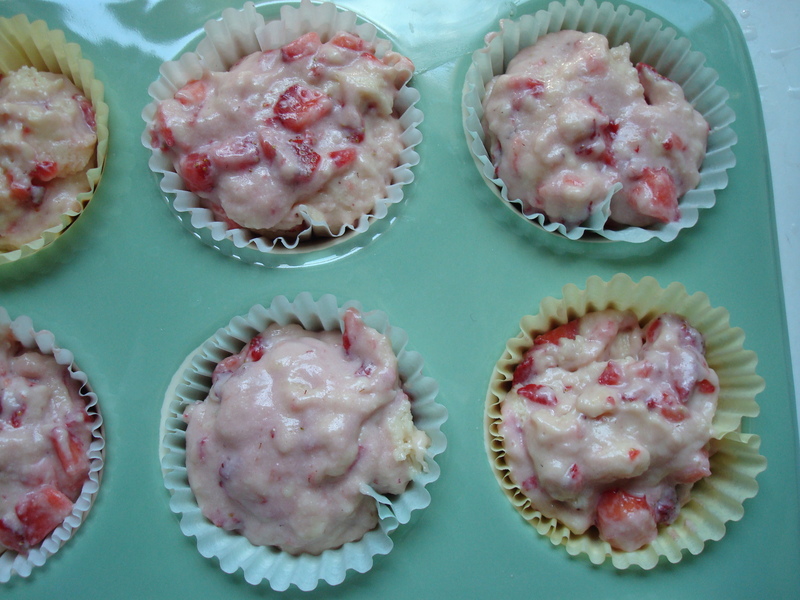 Place muffin cups in 12-cup muffin tin. Set aside. Put butter and sugar in the bowl of an electric mixer fitted with the paddle attachment. Mix on medium-high speed until pale and fluffy, about 3 minutes. Reduce speed to medium-low; mix in egg, milk, and vanilla. Reduce speed to low; gradually mix in flour mixture. 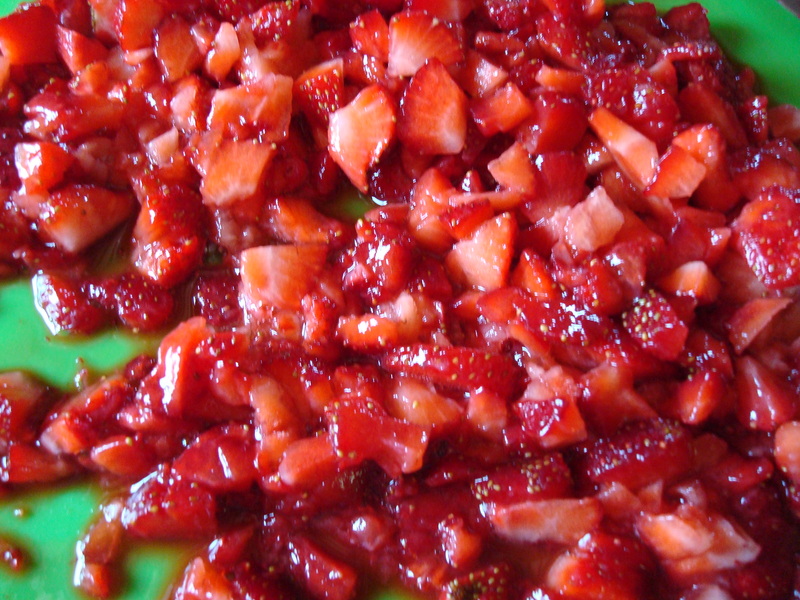 Fold strawberries into batter with a spatula. Spoon batter evenly into muffin cups. 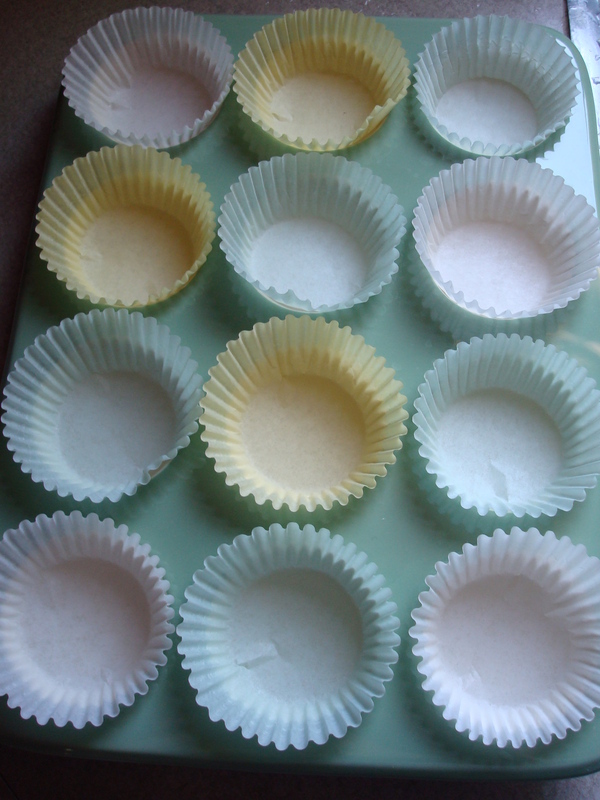 Bake cupcakes for 25 minutes or until toothpick inserted into center comes out clean. Cool on wire rack. 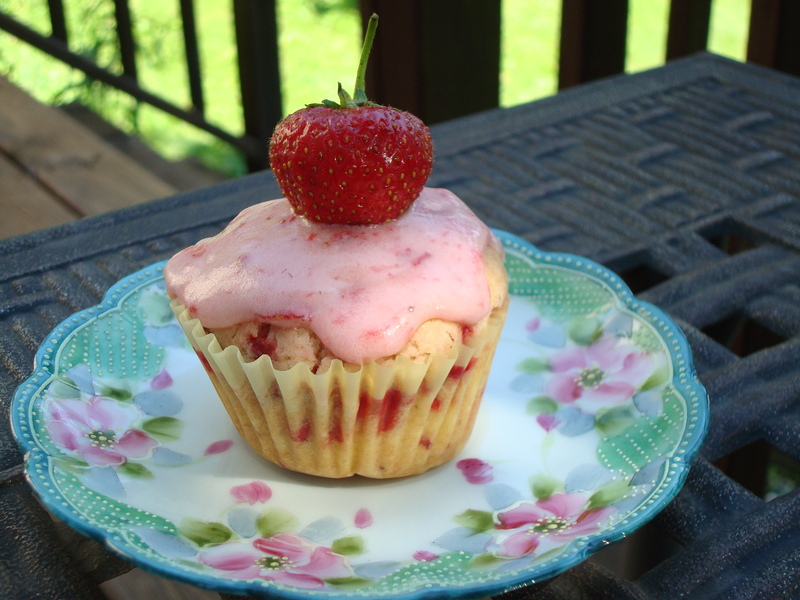 If desired, frost with strawberry mascarpone frosting (recipe below). Cake without frosting is just not worth it. Might as well just go on a diet at that point in time and choke down some dry rice cakes. No thanks! Oh my Gosh! I loveeee cupcakes!!! And I was just saying to my mom this morning…hmmm, what should I use my brand new calphalon cupcake pans for?? Your ears must have been buzzzzzing!!! Thanks KJ!!!! Glad I could help! Now get to baking them!!! I’m thinking that these will be better than my strawberry-rhubarb shortcake for the 4th July dessert. Ah, yup. Thanks, KJ.